The Hug and Pint is a vegan bar, eatery & music venue in Glasgow’s west end. We serve a wide range of craft beers & ciders, premium spirits and a rotating selection of by-the-glass wine, with a focus on local producers as much as possible. Our chefs create fundamentally exciting and original food, the like of which you won’t find elsewhere in Glasgow. The menu is inspired by a wide range of Asian cuisines and our kitchen uses absolutely no animal products. The food and our staff have been critically acclaimed. Since opening in June 2015, our live music programme has been one of the strongest Glasgow has seen, and has featured both well-established and up-and-coming local artists, as well as some of the most exciting international touring acts on the circuit. 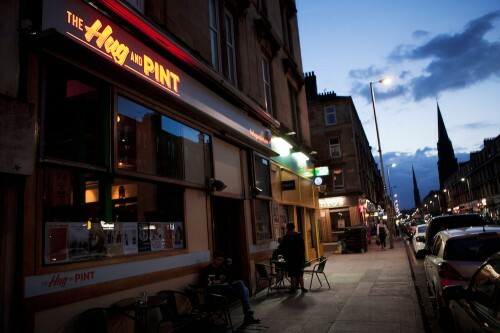 Inspired by Arab Strap’s “Monday at the Hug and Pint”, our aim is to provide “The Friendliest Atmosphere in Scotland”. The band gave us their blessing to open our version of The Hug and Pint – with Aidan even designing our logo.